That singular focus has its own advantages. Consider graphics, for instance. Without having to take into account the countless hardware variations that exist in the PC world, Ensemble was able to concentrate on making Halo Wars look as good as possible. "Because we're only going for one machine," Ryan explains, "we can spend a lot of the effort that normally we have to do supporting lots of different graphics cards and things like that on the PC, we can put a lot more effort on lighting, textures, that sort of thing, to make it a real next-gen looking game." Anybody who's seen the game in action knows that it's a looker, and part of making the graphics part of the gameplay experience means locking down the frame rate. From the beginning of the development process Ensemble has been working to keep the frame rate at a steady 30 frames per second, giving the action a smooth appearance and without chugging in the middle of chaotic battles. "We found that very key to having a good experience," Ryan says. Perhaps more important, in our networked age, is multiplayer support. Here Ensemble finds itself under pressure, because the Halo games have set the standard for how online multiplayer should work on the Xbox. 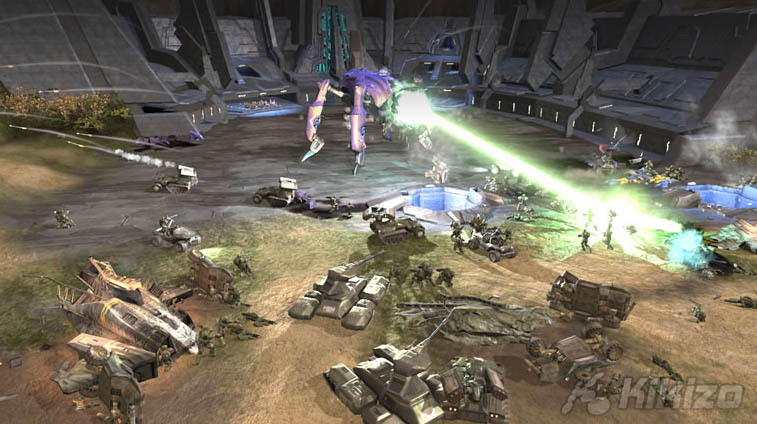 Much like Halo 3, which allows for people to play through the story mode in c-operative mode, in Halo Wars, Xbox 360 owners will be able to play the 15-scenario singleplayer campaign with a friend on Xbox Live. Ryan was reluctant to go into too many specifics of what's in store for the more competitive online modes. "Bungie has obviously set the bar with their support for multiplayer in Halo. So we're going to have that and we're going to do as much as is humanly possible before the game ships," he says. Players will be able to play together with and against each other but they won't be able to make their own content. The tools, as described by Ryan, are simply too complicated right now, and the game has not been built with this option in mind. Leaving out user-created content, however, doesn't mean that the game won't have any longevity. Between the 15 campaigns that make up the story mode and the various multiplayer modes, Ensemble is aiming for an experience you won't be looking to flog a couple days later. "Nothing's worse than putting 40 hours of content in the game and only 5 per cent of the people finishing it, and of course nothing's worse than putting 6 hours of content in the game and everybody finishing it and taking it to back to GameStop to sell it." "We want people to finish it," Ryan adds. Officially, Halo Wars has a release date pencilled in for some time during 2008. The game is obviously coming along well, with the core mechanics in place and both single- and multiplayer modes being finished off. With Bungie's shooter only days away now, Ryan is clearly reticent to announce a date and draw attention away from what Microsoft is hoping will be one of the biggest entertainment events ever. "We need to give Halo 3 time to ship and sell," he says. '"You do the math." Halo Wars will be out for the Xbox 360 in 2008. For more on the game, check out www.halowars.com and our previous coverage.